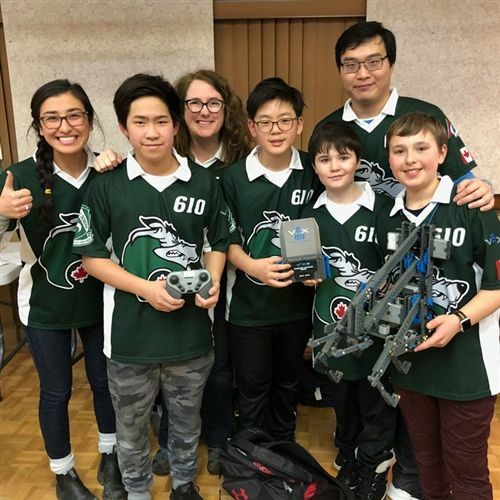 Teamwork, critical thinking and communications skills were tested at the VEX IQ robotics tournament in Aurora on February 2, 2019, and Crescent’s Middle School robotics teams had great results. At the tournament, 36 teams from schools and clubs across southern Ontario competed in pairs. Their robots had to work collaboratively to score points by completing tasks. The tasks include stacking coloured hubs, removing hubs from a structure, and parking or hanging on a bar. Teams also competed in a robot skills challenge, where one robot tries to score as many points as possible. Crescent’s Team 610E was named the tournament’s Teamwork Champions, thanks in part to the consistently exceptional driving skills of the team members. And, along with their partners from the Discobots team, Team 610E was the top-scoring team in all of Canada. This qualifies them for the Provincial Tournament that takes place in Brampton on March 2.